Now that I’m 31 books into the massive Morland Dynasty series, I’m finding it more and more difficult to say anything much in my reviews. I don’t want to say too much about specific characters because that would mean spoilers for people who are reading the series but aren’t this far along. The year-by-year approach Cynthia Harrod-Eagles is taking to World War I means that there aren’t a lot of new historical events to talk about. And after 30 books, I know pretty much what to expect in terms of the writing. 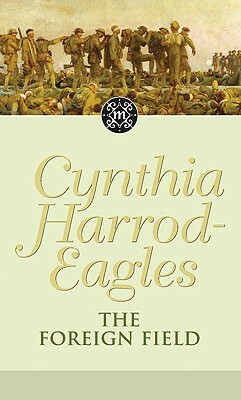 So, for those of you who know nothing of this series, I’ll just offer the background: The Morland Dynasty series by Cynthia Harrod-Eagles explores English (and bits of world) history as lived by one Yorkshire family, the Morlands. The series begins with the Wars of the Roses in the 15th century and is—alas—slated to end with the 34th book, set in the 1920s and scheduled to be published later this year. The Foreign Field takes place in 1917. Not much has changed for the Morland family since the conclusion of the previous book. Most of the men are fighting in the war, and those who aren’t soon will be. The women are at home, doing war work that ranges from nursing to giving tea to soldiers at the train station to flying planes to raising funds and planning for mobile X-rays to go to the front. In The Foreign Field, some of the women will take their skills all the way to France. In the midst of all this, they are struggling with love, loss, and new life. Although most of the book focuses on the war, several chapters are devoted to the Russian Revolution, as one of the Morland men is a diplomat assigned to St. Petersburg whose fate becomes entangled with that of the Imperial family. There are also new developments in the long-running fight for women’s suffrage. Other than that, the history is much the same as in the previous book. More war, more trenches, more death. The problem now is that the characters are feeling the weariness of years of war. Plus, the long fight has depleted the Britain’s resources, and political machinations are keeping some resources and men from reaching the front. As for the various relationships, the principal romance at this point in the series is not one that has ever interested me much, but a few new developments in that arena have me curious about what will happen next. The challenge for all the couples is sorting out how to be in love during war. Does the war mean it’s acceptable, even advisable, to put tradition aside and marry without meeting each other’s families? You can see how these years were pivotal on so many levels. One of the great pleasures of this series is seeing how so many seemingly separate events and movements were linked across the years. The Foreign Field continues this trend. Yeah, it’s a big commitment to read them all, but I’ve enjoyed it.